A social marketer's dream; a thoughtful reader's nightmare. 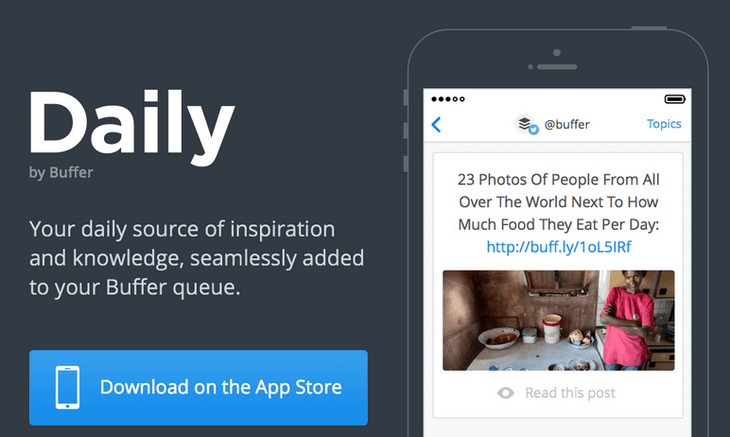 Buffer came up with a brilliant idea for social media marketers – a mobile app that lets you share ple-e-enty of relevant news via your social networking accounts, making you look like you are truly savvy in your field of expertise or interest. It is both a blessing and a curse, and may increase the number of your Twitter followers, or send your account into oblivion, and if you want to know why – read on. First, let’s take a close look at what this app does. Daily’s human-based search algorithms find relevant stories, articles and posts for you and give them to you in batches. And here is when I felt the first nag of skepticism – human, hand-picked stories for a mobile app? This could work when Daily has 100 users, but who is going to hand-pick relevant stories when it’s 100.000? Daily answers that concern by limiting its outreach to five niches only, mostly about and around marketing and entrepreneurship (see the list below). According to the UI’s layout, color scheme and load time, you are not overly encouraged to read through the articles with catchy titles, since the stories load slowly and are highlighted in dull grey. Instead, you have two colorful options – green and red. Swipe green and post the link to your social profile via Buffer; swipe red – and send the news into the garbage can. Does it sound familiar? Exactly, Buffer positions Daily as ‘Tinder for news,’ but it also reminds me of Yahoo Digest, which I also down-voted for encouraging shallow reading. The stories you pick are queued to be posted to your Twitter followers, and analyzed to further produce more relevant batches of news and stories for the next day. 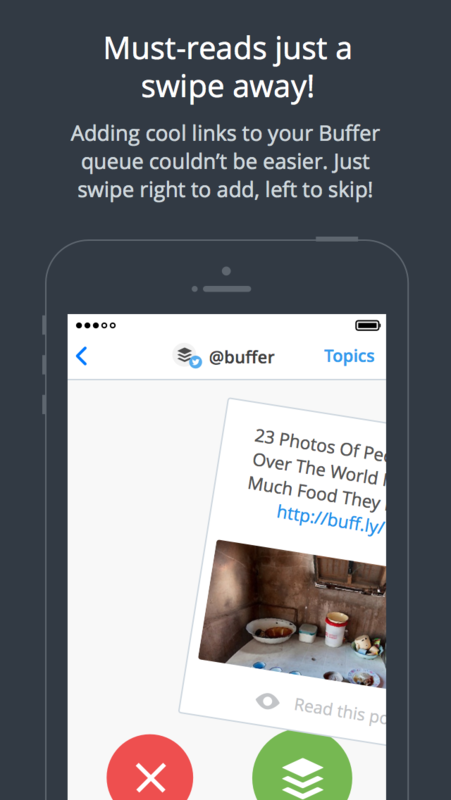 In case you missed Buffer’s web and iOS app for easy sharing on Twitter and Facebook, you may want to check it out and see it for yourself how easy it makes sharing, while Daily solves the only problem that’s left – finding stuff to share. There are two potential problems here. One is you have to rely on the app’s algorithm to find the news for you, but yes, it may be very easy to share. Two is you might lose your followers because you run the risk of flooding your social profiles with links that make you look like an automated, artificial and indifferent individual. Many social marketers have long ago figured out that emotional triggers make people click, like and follow. So, think of it in terms of marketing – is there an emotional trigger behind the shared article you have barely read? The tweets that I get re-tweeted are the ones about stuff I read, enjoyed or got mad about – they are and they sound natural, emotional and personal. Buffer swears the stories are hand-picked, i.e. a human reads them all, one by one, while creating your daily batch. The app is free and offers daily batches of 25 articles. Daily might be properly used if you take on individual approach harvesting the batches of relevant articles and sharing them on social media with a personal insight or a digital signature of your individuality. However, it is most unlikely to happen since 95% of users are too lame to read anyway, so we are looking at yet another wave of social bots. And that’s what social media is turning you into – searching for stuff to share to look like you care doesn’t equal to actually caring, so eventually we, the social network users are shallow and indifferent in core, yet overwhelmed and bombarded by the sheer amount of information we digest daily. And Daily wants to automate even that. If you are a marketing or entrepreneurship-focused blogger looking for a helping hand at growing your Twitter, Facebook and LinkedIn circles and followers naturally – Daily might be your next big thing. It is free, marketing-focused and handy, providing you with a daily batch of 25 human-picked articles on the subjects of your interest, so all there is left to do is choose the ones that ring a bell and tap share. However, the number of content niches covered by Daily is very limited, which probably allows it to provide hand-picked stories. 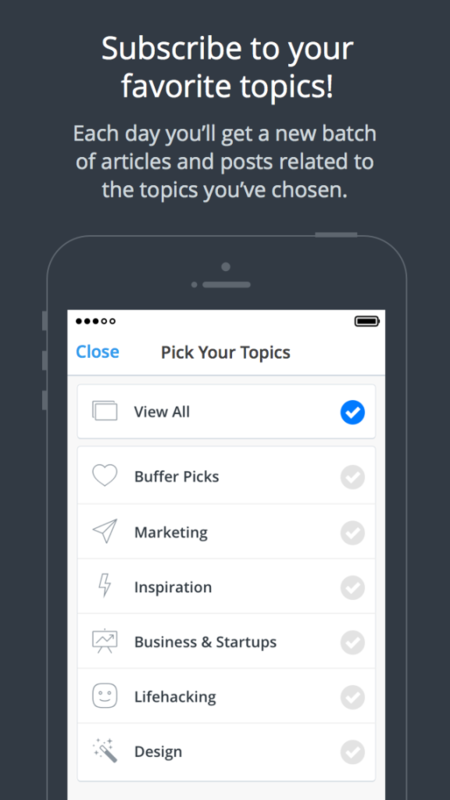 My main concern is this type of apps encourage users to digest content thoughtlessly. If that resonates with how you feel, you might also spend a minute reading ‘You Won’t Finish This Article,’ to stop and ponder for a minute who we are turning into.